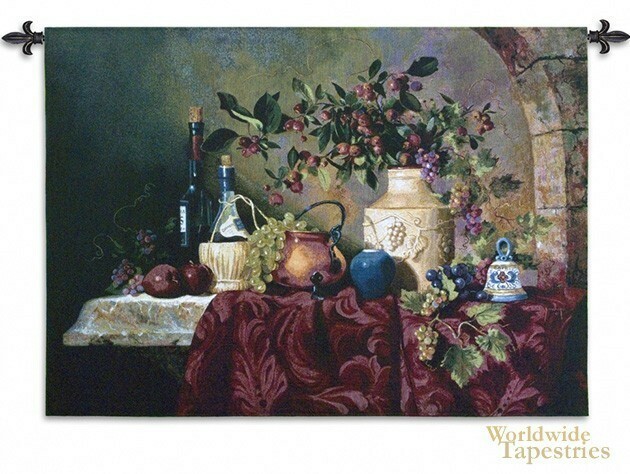 A rich feast of wine and fruit is seen here in this still life tapestry "Tavola DeCapris" by Fran DiGaicomo. The setting is accompanied by a gorgeous urn of flowering branches, set on a ledge win a setting which is typical of those seen in Mediterranean villages. The abundance of the Mediterranean countryside and the wonderful life in the countryside is reflected in this still life setting. This tapestry is backed with lining and has s tunnel for easy hanging. Note: tapestry rod and tassels, where pictured, are purchased separately. Note: Tapestry rod and tassels (where pictured) are not included in price. Dimensions: W 53" x H 37"